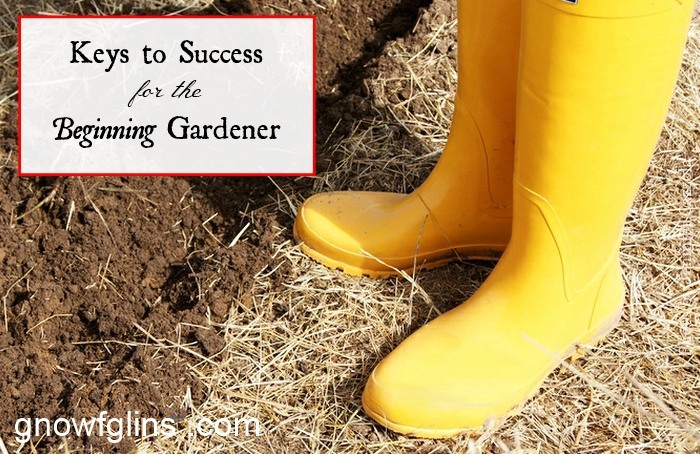 I put together a few gardening tips so that you can have a successful first season. These basic tips are the things I wish I had known when I first started. It can be tempting to purchase more than you can manage, especially when browsing through transplants at the local nursery or flipping through the latest seed catalog. It's a lot of fun to sow seeds and tend plants in the spring, but it can get overwhelming in the summer heat, when pests, weeds, and drought all descend upon your garden. So, don't plan to grow your entire food supply, at least not during your first season! 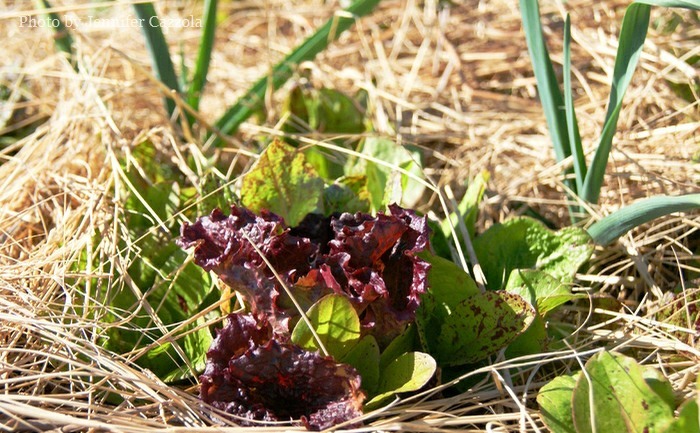 Plant a small, easily-manageable garden, and choose a few crops. Grow what you and your family enjoy eating. If rhubarb isn't a favorite, stick with something you know will be popular on your table. Grow a variety instead of limiting yourself to vegetables: include herbs and some easy annuals like flowers, to grace your kitchen table. The internet is a great place to gather information, but it is also a good idea to talk, face-to-face, with other gardeners in your area. Get in touch with a local gardening club and/or contact your local extension office, which usually offers many free materials and services pertinent to your particular zone. My extension has a hotline where homeowners can call in with gardening questions. During the spring gardening season, free classes are offered covering a variety of gardening topics. See if your local extension offers the same. Additionally, build up a gardening library so you can seek the “advice” of books! Some of my favorites are The Vegetable Gardener's Bible by Edward C. Smith, Square Foot Gardening by Mel Bartholomew, and Carrots Love Tomatoes by Louise Riotte. Periodicals such as GRIT and Mother Earth News frequently offer gardening advice suitable for beginners. 3. Choose varieties well suited for your area. Every region has its own particular challenges, whether they are pests, soil problems, or tricky weather conditions. Your friend in the Pacific Northwest might have a favorite melon variety you'd like to try, but you may not get the same results in your southern garden. While it is good to experiment with different crops and different varieties, I recommend sticking with those specifically recommended for your area — at least when you first start a garden. This will give you a feel for starting seeds or transplants, fertilization, dealing with pests and weeds, harvesting, and saving seeds. Proven varieties will also better ensure your likelihood of success, and honestly, there's nothing better than success to encourage you to take your newfound skill to the next level. 4. Choose crops that are easy to grow. Ambition is great, but don't choose an espaliered apple tree as your first gardening project. You may want to consider using established transplants instead of starting seeds. If you do choose to go the transplant route, I recommend you purchase from a local nursery. Big box stores do have a large variety at a lower price, but the plants have most likely been grown elsewhere and shipped in. Those grown locally have been selected for and acclimated to your climate. Knowledgeable staff at the nursery are also able to advise you in your choices. In my opinion, the easiest crops to grow from seed are lettuce, radishes, zucchini, marigolds, zinnias, and sunflowers. These crops take off pretty quickly and are easily cared for once established. Crops such as tomatoes and peppers are started from seed indoors, hardened off, and then set outside. This is a lot to ask from a new gardener and for this reason I recommend purchasing transplants. Herbs are fun to grow, but many also require additional care when started from seed. I advise purchasing these as transplants as well. Other garden favorites such as roses, berry bushes, and fruit trees make wonderful additions to your garden, but again, I advise waiting until you have a few growing seasons under your belt. 5. Make sure you know your first and last hard frost date, and the proper times for planting crops. As a new gardener I had no idea what a “last hard frost” was, let alone why it was important. I also had no idea that there were cool season crops and warm season crops, and in my zone that they don't always grow together at the same time. I figured if the weather was warm, it was okay to plant. In my first garden, the lettuce was planted weeks too late and my tomatoes way too early. If you don't already know this information, consult the Farmers' Almanac or again, get in touch with your county extension office. Are you new to gardening? What are you planning to try this spring? May I give a friendly warning/suggestion especially to new gardeners? Be aware that being the “first in the neighborhood” to have crops out of the ground (greens, peas, beans, kole crops) could definitely ingratiate you to your neighbors. The bunnies will be feasting on your nice tender edibles when there’s not enough wind plants to consume. The neighbors will appreciate it because the nice furry bunnies will already know where the good food is. Suggested coverings – old wire freezer baskets with a rock on top (my favorite); those plastic “egg crates” sold in stores with a rock on top (beware the sun will weaken the plastic over time if you plan to use them for something else); the net fabric known as tulle from the fabric store; or even commercial fabric row cover (the most expensive option). The tulle and row cover will need some kind of support (I wish I could find a source for used croquet hoops.) You can use anything that lets light and air through but not bunny heads. One other thought from personal experience. Don’t put those bean seeds in the ground too early. I had a tough time figuring why I had such a tough time getting beans started (then the bunnies would nibble them off grrr) One day my neighbor mentioned that it’s best to wait till the ground is nice and warm for beans. Voila, they come up every time (and I ward off the bunnies). Hope my experiences are helpful to someone. Thanks for sharing that Joy! We had a difficult time with rabbits last year too. Wire freezer baskets are a great idea and so inexpensive! Sometimes gardening gear from the gardening stores costs more than it should. We just started our homestead in August, and we found the best boots are called “Muck Boots” it’s a great brand and totally waterproof and streamlined to the foot and leg. Leslie my husband has a pair of those. He absolutely loves them. He found them at our local feed store actually. For a renter with some space, always go the container garden route. My first garden was in an old flower bed and my landlord considered it an upgrade and lived. The second house I was in, not so much. Even with a proper yard, taking a part raised beds and a garden set up is a huge pain. My current landlord loves my container garden. I just purchased (over a couple months) a row of large pots and trellis to match. It’s easy to maintain and move if you have to. You can do so much in containers if they large enough. I have tomatoes, peppers, herbs, melons, squash and strawberries. Thanks for sharing that Madeline. Container gardening is a wonderful option even if you have a permanent situation. We have an acreage but I’ve considered doing a few things in containers on our back porch, such as herbs, that would be handier to the kitchen. I’ve also done some tomatoes in those big white five gallon buckets.